The Trombone Choir at Stephen F. Austin State University will perform at 7:30 p.m. Tuesday, Nov. 27, in Cole Concert Hall on the SFA campus. 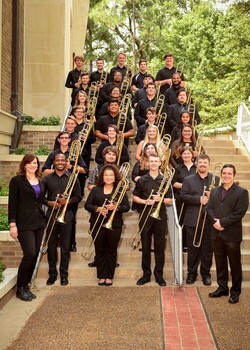 NACOGDOCHES, TEXAS - The Trombone Choir at Stephen F. Austin State University will perform a recital at 7:30 p.m. Tuesday, Nov. 27, in Cole Concert Hall on the SFA campus. The program features "Hear the Voice and Prayer" by Thomas Tallis, transcribed by Robert P. Holland, and The Beatle's "Yesterday," arranged by Dr. A.C. "Buddy" Himes, dean of the SFA College Fine Arts. Another highlight of the program is an arrangement of "Rakoczy March" by Hector Berlioz. Scott will conduct a smaller group of 10 players performing "Concertante Antiphonale" by David Uber. The program will conclude with David Kneupper's arrangement of "White Christmas" by Irving Berlin and "Good King Wenceslas" arranged by Tommy Pederson.